Alright, so i've been sitting around here, and I know there's quite a few releases that people may have questions upon from outside the US or ones people do not know even exist. I've decided to create a thread for those miscellaneous releases that are coming out or are out that wouldn't garner much discussion as a general thread. Feel free to ask questions about what releases are the best to get, which you shouldn't get, and other general things. Hey guys when is Godzilla 1985 coming out on DVD? GodzFire wrote: Hey guys when is Godzilla 1985 coming out on DVD? It's already out dude. For now it's a limited time eBay exclusive, but soon it'll be available everywhere! This'll be a neat thread, posting so i'll be subscribed. Idk if this is the thread for it but out of the blurays that have been released, which ones have the best HD picture? Lain Of The Wired wrote: Idk if this is the thread for it but out of the blurays that have been released, which ones have the best HD picture? The Kraken releases look pretty damned good. The Sony ones are uneven and the MB ones/Biollante are just the underwhelming Toho transfers, but they're probably worth picking up anyway. Criterion's release of the original is an absolute must. Universal's KKvsG looks decent but it's only the US version. That's a pretty odd selection of movies, isn't it? It's got the original, Raids Again, and then the rest is late Heisei and Millennium. Fortunately, Godzilla Raids Again is available separately on German Blu-ray, as is Ghidorah the Three Headed Monster. New pics of that German boxset from Splendid. Limited to 3,000 copies. I don't think I need to translate the titles. Anyone know which site has the best digital version of Gojira, or all they all about the same? I know iTunes and Vudu have one, but the Vudu one is SD and Idk on the iTunes. What's on the Gamera Legacy set? As in, are there subs? 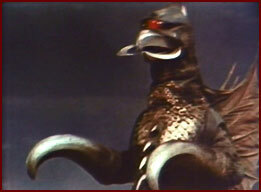 Mechagigan wrote: What's on the Gamera Legacy set? As in, are there subs? Yup, each film is in Japanese with English subs. There's a total of four discs, with each disc containing three films (except for one which has 2). I've heard the quality is garbage on account of compression, though; if you can afford to spend more, there's a bundle available with all the same films on Blu-ray. omgitsgodzilla wrote: I've heard the quality is garbage on account of compression, though; if you can afford to spend more, there's a bundle available with all the same films on Blu-ray. it is fairly poor, all it has going for it is the fact it's cheap and has a bunch of films. The Blu-ray collection goes for about $25, and while they're not the best they could look either, they are a noticeable bump up in quality. Obviously you need a Blu-ray player to watch them. It's worth mentioning again that all of Kadokawa's HD transfers for the Gamera films are only in 1080i, so when you add additional compression on top of that, they're not going to look much better than watching the Shout DVD's upscaled. There's definitely some additional detail to be found on the Blu-rays, but between the interlacing and the lackluster colors, contrast, etc. they certainly leave something to be desired. I am considering purchasing the Blu-Ray of Destroy All Monsters! But I have concern of that particular release. Is it true that said release was stripped of all special features, including trailers and commentary? Yep, all that's there is the movie, with Japanese and International English audio. omgitsgodzilla wrote: Yep, all that's there is the movie, with Japanese and International English audio. The later release doesn't even have the AIP dub??? Well, lucky me, I got the original pressing anyway.